01 starts the drils, 02 then follows, then 03. Continue this rotation until all players have gone. Players carry the puck through the neutral zone and take shots on goal. 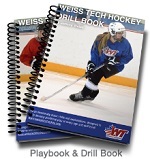 For more drills I recommend the Weiss tech hockey playbook and hockey Drillbook, you can buy them separately, or together as a bundle Learn more about the playbook and drillbook here. If you don’t know Jeremy Weiss you should definitely follow his blog as he is a very smart coach, and he is always sharing new drills for all age levels. Hi my name is Jeremy Rupke. My goal is to break every hockey skill down into easy to understand articles and videos. I explain everything step-by-step to help others improve. I'm active on Instagram, Facebook and more, you can follow through the links above. If you want to learn more about me you can read my about page. Thanks for reading and sharing! Practice tomorrow can’t wait to use a couple of these. We have practice tomorrow, using 2 for sure of these drills. Awesome drills Jeremy! Will definitely use a few of these with the PeeWee’s this year! Excellent source for new ideas. full ice, the 3 station move. Use HockeyShot.com coupon code: HOWHCKY001 to save $10! JOIN OUR TEAM OF OVER 10K HOCKEY PLAYERS! Sign up for our Newsletter for more hockey tips, tricks, drills, and ways to improve your game! Check out my stickhandling course! I have written a guide to stickhandling accompanied with a 30 minute stickhandling training video. This guide will give you everything you need to know to become a GREAT stickhandler. We recommend these products to anyone who want's to practice their hockey skills at home.